Interoperability can allow governments and health workers to make the most of their data. Here, data clerk Erastus Angula enters client information into the system at an HIV clinic in Omuthiya, Namibia. Photo by Morgana Wingard for IntraHealth International. Predictive analytics, rapid diagnostics, and portable, personal medical records promise a future where health systems are stronger and more efficient, and where anyone can live a longer, healthier, fuller life. But one of the prerequisites for this promised transformation is that health systems—whether they’re for diagnostics or patient records or lab results—are interoperable, meaning they can quickly and seamlessly exchange data using open standards. The greater the interoperability of a digital health system, the stronger it is. Interoperability isn’t just about futuristic health treatments. It is crucial to overcoming the fragmented and proprietary global health systems we have today, and can allow governments and their stakeholders to make the most of their data, including extending, upgrading, and preserving it. To fully realize the benefits of these systems, they must be able to exchange data effectively, and decision-makers inside and outside of government must be able to access the data efficiently to inform their decisions. Greater efficiencies. Siloed systems require health officials to collect the same data multiple times. This drives maintenance costs up and accuracy down (such as when data about the same person in different systems don’t match). Interoperability allows multiple systems to access the same data, at the same time, reducing duplication and increasing the efficiency of all the health systems. It also leads to more sustainable health system financing by allowing governments and insurers to track clients across multiple clinical encounters. Less vendor lock-in. Proprietary health systems can sometimes hold users hostage, such as when the Ministry of Health can’t make changes to the system without the software vendor’s (paid) consent. Interoperable systems, on the other hand, freely exchange data with other systems so governments are not locked into any one system or vendor. They can reuse, replace, upgrade, and modify modular components as they need by interchanging data from older systems to new functionalities without needing to change the older systems. Sovereign data control. Proprietary health data formats can restrict a government’s access to its own data. But interoperable open data standards allow governments to retrieve any and all of their data as they need, and to use it however they see fit. Interoperability isn’t just about futuristic health treatments. The global digital health community has been talking about interoperability for more than a decade, as part of the larger discussion around open standards, open data, and open source. So where are we with that? Actually, the global digital health community is in line with the public and private sectors in advanced economies. The global Fast Healthcare Interoperability Resources standard (FHIR, pronounced ‘fire’) is adopted by all of the major private health technology companies, including Cerner and Epic Systems, and, thanks to the efforts of OpenHIE, FHIR is also adopted by major open source solutions for middle- and low-income countries, including OpenMRS, iHRIS, and OpenSRP. mHero is a great example of interoperability’s potential in global development. This two-way, mobile phone-based communication system helps health officials communicate with health workers in even the remotest areas by connecting iHRIS (which lists health workers’ personnel data, including the facilities where they work) with DHIS2 (which lists the issues and outcomes of each health facility) and RapidPro (an advanced SMS communications platform). Because the data in all three systems are interoperable, a regional health officer who sees an emerging health issue in her DHIS2 reports can quickly find and communicate with the right health workers at the relevant health facilities, all without needing to configure data in one system before importing it into another system. She can just press a few buttons and send them text messages with confidence. Other tools are actually built on top of other systems. OpenSRP, for example, is built on top of OpenMRS, creating advantages in speed and ease of use that would be impossible without interoperability. The greater the interoperability of a digital health system, the stronger it is and the more likely it is to withstand interruptions, such as changes in staff, fluctuation in funds, changing data needs, or the effects of rapidly evolving technology. Want to assess the interoperability opportunity in your health systems program? The Health Information Systems Interoperability Maturity Toolkit covers technology, leadership and governance of health information systems, and human resources. 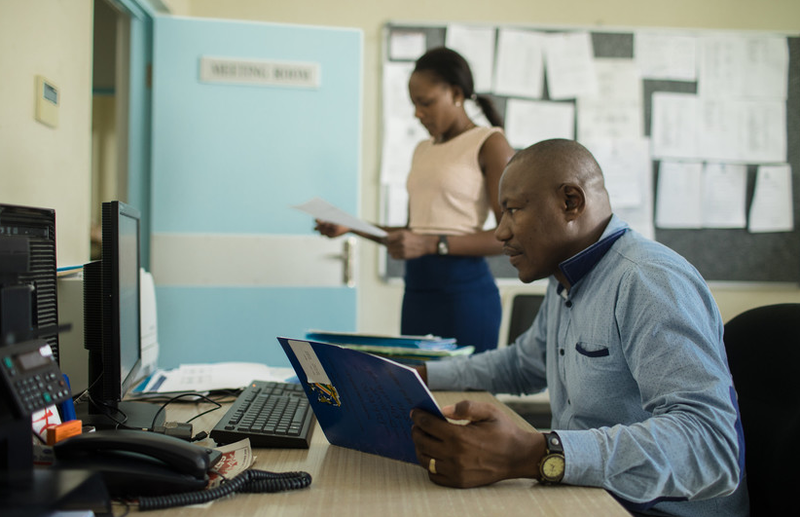 “Health information is really at the heart of health systems, and at the heart of developing—and maintaining—a healthy society,” says Bradley Wallach, Deputy Mission Director for USAID/West Africa. And interoperability is at the heart of health information. Learn more about interoperability, FHIR, and OpenHIE in practice at the 2018 OpenHIE Community Meeting, July 31 – August 4 in Arusha, Tanzania.